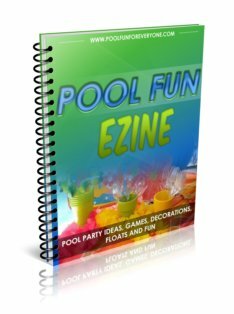 Looking for some ideas for jungle party games for your kids pool party? 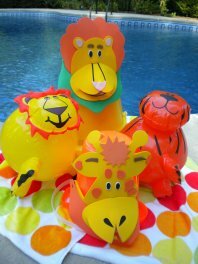 Guests can become their favorite animal with safari animal foam visors or play with lions and giraffes in the pool with themed beach balls. Provide each of the guests with an animal visor when they first arrive. Let the kids pick out their favorite jungle animal. Use them not only for the kids to wear but for some of the games as well. 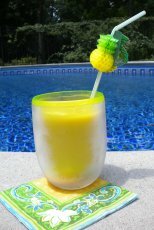 The visors are colorful and durable and make great take home party gifts as well. 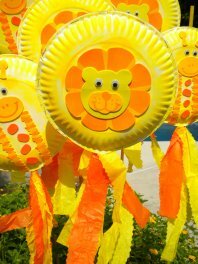 Paint paper plates bright yellow and with some help from a craft kit from Oriental Trading, make lion, giraffe, or zebra faces. Staple the two yellow plates together. Paint the dowel yellow and add some orange and yellow streamers. Our granddaughters always like to start the pool party with a parade to music. We choose "I Can't Wait to be King," from the Lion King Disney movie. 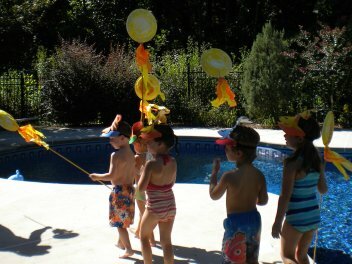 Each guest is provided with their own jungle animal and parades around the pool to your favorite jungle song. Encourage the kids to act like monkeys or prowl like a lion. Line the kids up at the diving board or the side of the pool. 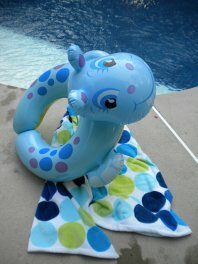 Instruct them to make the biggest leap they can into the pool while roaring like a lion. After each guest makes a lion's leap into the pool, instruct them to find their own wild animal beach ball with their name written on it. Let the kids just have some free time tossing the balls in the pool. Use these inexpensive beach balls as take home gifts for the guests. We purchased these Jungle Animal Beach Balls as a set of twelve. Use them as take home party favors as well. 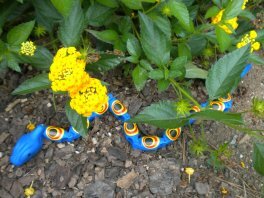 Hide these inexpensive wiggly snakes in and around the plants and bushes in your yard or around your pool. Make sure you have enough snakes for each guest. Let each party guest keep his snake as a take home gift. 12 Assorted Jointed Snakes - 15"
I love how Easter Eggs now come in a variety of shapes and themes - like these animal print eggs. 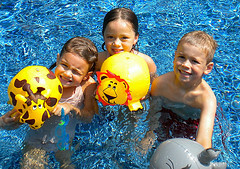 Hide them around the perimeter of the pool and fill them with candy, coins or stickers. A set of 24 is just at $9.99. Give each guest an animal print bag to collect their eggs. I love these plastic zebra bags (doesn't matter if they get wet) 20 bags for less then $5. Set up a station with a bowl of water, a wash cloth and wild animal tattoos. Assign an adult or teen to manage it. We did this while we waited for all of the guests to arrive. Let the kids pick out their favorite color. Just press a wet wash cloth on the tattoo for about 30 seconds or so and then peel it off. The tattoos come in a pack of 72 so we let them put on as many as they wanted. The tattoos stayed on well in and out of the water. Provide one hippo split ring for one team and another animal, like a monkey split ring for the other team. 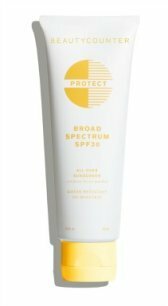 You can find them cheaper in the stores - like Target or your local grocery store than you can on line. Give each team their names - like The Hippo Team or the Lion Team. Each guest takes a turn swimming across the pool and back and gives the float to the next team member. You probably already own at least two noodles. If not you can get them at the dollar store. Wrap one of the animal foam visors on each noodle - for instance the parrot team and the monkey team. Divide the swimmers into two teams - the Parrots and the Monkeys. Riding on the foam noodle, each team member swims the width of the pool and back. Give "the parrot" to the next team member. Have each of the kids line up at the shallow end of the pool. Let them know that they are monkeys trying to safely cross the jungle river to make it past the lion. 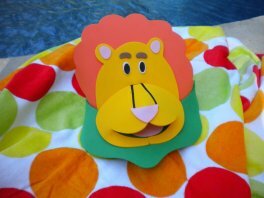 Assign an adult to be The Lion and have him/her wear this lion visor. When The Lion touches or tags a monkey he/she becomes frozen. Another monkey can come and rescue them by tagging them and unfreezing them. The game ends when each monkey makes it to the other side. I purchased this lion clothes hamper at Target for $6. 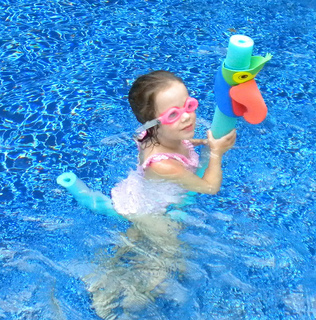 We used it for pool party games and later to hold smaller pool toys. The hungry lion is held by an adult in the pool while the kids take turns feeding it by seeing how many mini inflatable fish they can toss into the lion's mouth. I found these colorful floating snakes at Target. The kids, boys and girls, really loved them. 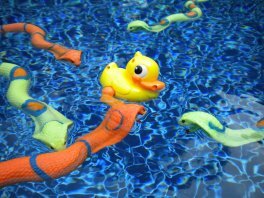 Place a harmless looking wind-up duck in the pool and surround it with snakes. Each guest gets a turn to rescue the duck - but without touching any of the surrounding snakes.